Sometime around 1998, I went to a business planning seminar for Realtors in San Francisco. The guest speaker and presenter was Mike Ferry. Agents spent a lot of money to come see how to create an effective business plan and set their goals to be successful in Real Estate. Over 350 agents attended this Goal Planning seminar. Many bought books, videos, tapes, visual aids, cassettes and other stuff to help them with their Real Estate Business. While at this seminar, I had what I call a BFO! (Blinding Flash of the Obvious) I realized that every agent in that room and every agent here online all have one thing in common! We ALL NEED TO MAKE MONEY! Some a little more, some a little less, so I started developing my own software application that would help Brokers and Agents determine their goals based on specific desired incomes. I know that we all want to make a million dollars, but this program is designed to help you make what you need to survive, and then some. It’s called Agent Assist. It started as a planner, then I added income and expense tracking. It grew to include sellers and buyers net sheets, progress analysis, title and escrow fees, mortgage calculator, renters chart and more. Now it has resource tracking, transaction tracking, charts and production graphs and a lot of tools to assist agents with their business. Hence, the programs name Agent Assist. I am now up to version 5.0. This program has become what it is today primarily because I have listened to my clients and their needs. It has a great, non-threatening look and feel driven by a basic flat file menu system. 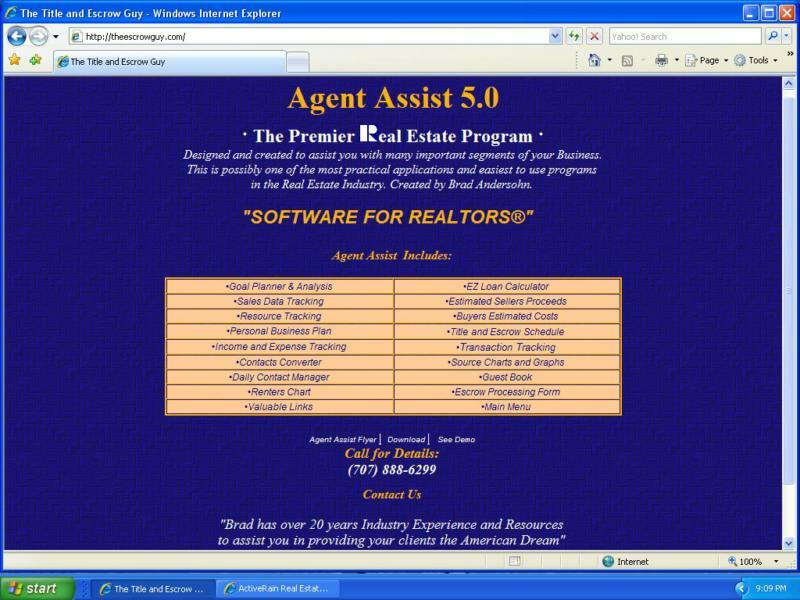 Agent Assist 5.0 is The Premier Real Estate Program Designed and created to assist you with many important segments of your Business. This is possibly one of the most practical applications and easiest to use programs in the Real Estate Industry. I want you to check out the program and let me know what you think? I will provide it to you for reading this post for just $29.99 and in exchange, I just want you to post your comments and feedback. I want your opinion. The software was written in excel so you will need to have Microsoft Excel installed on your PC. (Works on the Mac if you can run windows). 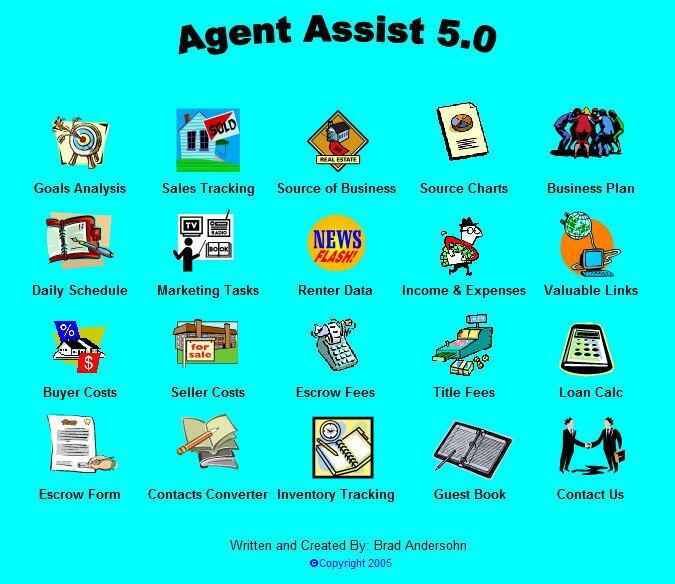 If you search www.google.com, just type Agent Assist 5.0 and you’ll find it. You can also get it from my website, AGENTASSIST. No gimics, no expirations, no ploys or spoofs. This is just my way of giving back to my industry, my customers, and my fellow ActiveRain bloggers. If you are interested in getting/purchasing a copy, post your comment and let me know. If you already have a copy, please post your thoughts and comments. Lastly, after trying the application, if there is something you would like to see me add or take away, please let me know. I appreciate your comments and help. Whether you are brand new in the business, or have 20 years experience, I know you’ll love this program. By the Way…every penny earned from Agent Assist goes to feed starving Children in California…….MINE! !